Biographical Info Jessica Canard is a Multimedia Visual Artist with a focus on creating murals and making art with people. Born and currently based in Winnipeg, Manitoba, she creates art full time since completing her Bachelor of Business and Administration degree from the University of Winnipeg in June 2017. With her art practice she wants to share skills, ideas, and experiences through the creation or facilitation of art. Her roots are from Sagkeeng First Nation where she uses art to explore, reclaim, and bridge this part of her heritage with urban living. Jessica knew what she loved at a young age and has followed that passion which led her to facilitating art workshops for youth at the age of 17 for Graffiti Art Programming Inc. as a way of giving back for all the opportunities she has received. 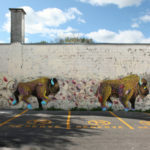 In 2012, at the age of 21 her personal work was purchased by the Canadian Museum for Human Rights in partnership with the Michaelle Jean Foundation, at 24 she created her first out of province collaborative mural for Unceded Voices: Anti-Colonial Street Artists Convergence, and at 27 she created her first international mural commissioned by the University of Arizona’s Women’s Resource Center.